Another journey into the strange world of 8-bit Dungeonsynth this time the sonic delvers have unearthed arcane tracks from the cobwebbed catacombs of the abandoned BBC Micro software archive. 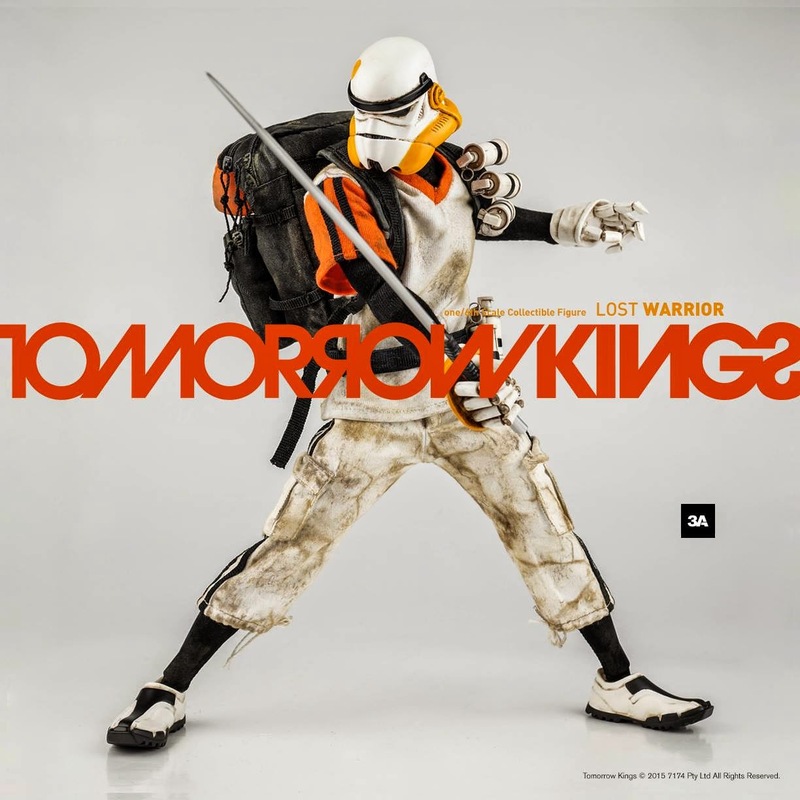 Perversely all tracks here are cover versions. By virtue of the dark sorcerous arts of programming in assembler code these otherwise otherwise innocous pieces of music have metamorphosed into something uncanny and unnerving. The Stranglers "A Midnight Summer Dream" played by a melancholic android harpsicord atomaton. The D&D medieval fantasy imagery of Spellbinders endless twisted, turning corridors - each rendered in wonderful 1-bit colour, summons Dungeonsynth vibes. Franco-electronica band Space's 1977 chart hit Magic Fly rendered on a Texas Instruments SN76489 sound chip by Byte the Apple is a cold, downbeat piece of atmospheric electonica, evoking vast cavernous tracts of frostbitten wilderness and melancholic tortured birdsong. Yorkshires finest synthpop duo Fiat Lux scraped into the top-40 in 1983 with thier track Secrets. Byte the Apples cover version ventures into melodious spheres not usually associated with Dungeonsynth, but creates an atmosphere of ghostly spirits crying in grey stone graveyards, pining for their lost souls. There's some grim bass sounds lurking in the sinister depths. 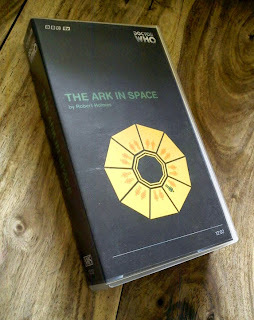 So having scored a bunch of Oldschool British Science Fiction VHS tapes at a car boot sale, including some Gerry Anderson (Thunderirds, Joe 90 and two Space 1999 cut-and-shut tv movies) a complete set of Blakes 7 and some random Doctor Who stories, it's time to fire up the trusty Panasonic Super-Drive. Kicking off with Doctor Who: The Ark in Space - Series 12, Story 2. Tom Bakers second outing as The Doctor broadcast in the early days of 1975. A good vintage, this one. The first episode slides into a series of puzzles, how do we open the locked door ? how do we stop the sentry robot? How do we find the missing companion? It's a bit like watching The Adventure Game, so as we get to see Tom Baker express full range of problem solving expressions through 'gosh this is perturbing' to the 'a-ha! I've got it moment' it is immensely fun and rather gamey. In the Far Future there is only Science. With episode two, The Ark in Space steps up a gear and introduces the slowly defrosting crew in neat 1970s space fashions. The costumes were designed by Barbera Kidd, who long term followers of this blog may remember was responsible for the space-aztec transformation of the goddess Diana Rigg. The denizens of Nerva Beacon sport trousers, tunic and a kind of high collared bolero jacket with colour trim - slightly reminiscent of a nurses uniform, and apart from the tailoring, unisex in design. It's a nicely fitting design for this egalitarian clean-lined utopian scientific community. The humans of the far future have decided that those who are functionally useful to a technocratic society should be deep frozen in an orbital space station, whilst Earth and it's less functional inhabitants can get blown away by raging solar winds, or go and live in underground bunkers, no-one cares. With the Second Class Telephone Sanitisers and marketing experts gone the way of the Golgafrinchans the Nerva Ark are left with the super-fuctional cream of the crop, Ayn Rand would be proud. 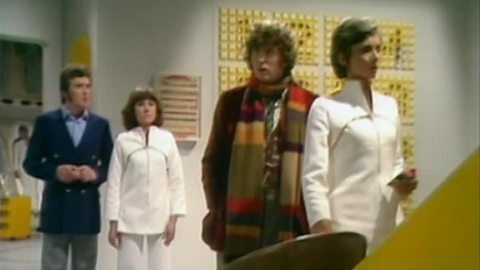 The newly revived Noah (an honorific title from old earth mythology) is so aghast at the potential that these new humans (Doctor, Sarah Jane and Harry Sullivan ) might contaminate the genetic purity of the human stock aboard the Nerva Beacon, he threatens to kill them. However there is already something happilly going around killing the last remnants of humanity - The Wirrn - an alien creature pupates that inside a human, before hatches then devowering the host. Interestingly the larvae gains the knowledge of its victim, a psychic as well as physiological feeder. The story bounds along at a jaunty pace, until the Wirrn are defeated by a combination of self-sacrifice, willpower, ingenuity and long electricity cables being dragged through air vents. Along the way we learn the Wirrn are motivated by revenge for what the human colonists did to their species on the Andromeda system, and a thirst for knowledge, quenchable only through the consumption of juicy human scientist brain. As I'm reviewing a VHS tape, there are no extras, no behind the scenes look at how the made the vacuum formed plastic and styrofoam coffins, no commentary comparing the plot of a cryogenically frozen space crew getting infected by an invasive alien parasite with Ridley Scotts Alien or exactly how much bubble wrap and green poster paint it takes to make a Wirrn larvae. The alien effects are really are quite charming, but perhaps the story would have been better served by making the Wirrn a purely ethereal life form. 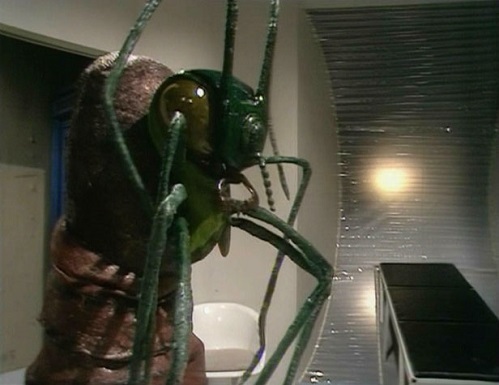 not unlike the Mara that would haunt the 5th Doctors assistants, or perhaps the emotionless, cold-war hive-mind paranoia of The Invasion of the Body Snatchers. Just a note on how nice VHS is tu use. Watch an episode, stop, eject tape. Do other stuff for a few days. Pop the tape back in, and it automatically starts at exactly the right place. No clicking though menus, no having to remember which one we were on, no skipping forward to the right time-code. It's almost like the format physically freezes time, if only the TARDIS or orbital cryogenic space stations were quite so reliable. New Star Wars? Ashley Wood gets hyped 3A style. Such things dreams are made of. And retro-scifi wargames, so let's give him a nice grimey coat of Oldhammer 40,000: Rogue Trader, or should that be Rogue Vader? Isolated by a temporal warp in meta-space, the Lost Warrior finds himself adrift in a war-torn world totally unlike his own. Surviving only by his wits and courage, hoping beyond hope, searching forever for a way back to the gleaming, moon-sized Imperial military battlestation he calls... home. Standard issue battery powered assault rifle. An elegant forged steel weapon for a more civilised age.